You’ve Heard of Bear’s Funds, Why Not BNP’s? When Bear Stearns nearly failed, made to merge, in March 2008 it wasn’t really a surprise. Yes, markets were shocked by the demise of the ancient firm, one of the bulge bracket cartel which suggested surprise over the severity of it more than that things were going bad. For more than a year, starting in early 2007, Bear had been steadily in the news for a few of its hedge funds. These were investment vehicles not owned but sponsored by Bear Stearns, which meant they had no legal obligation to stand behind them. Yet, they did, sensing that to leave them hung out to dry and their investors holding the bag would be more than bad for business. Subprime was contained according to Ben Bernanke, but for these two “high grade” funds people started to realize that wasn’t true. It wasn’t Bear’s products that ultimately started the crisis, however. Perhaps I am being too semantically rigid, as I classify those hedge funds as a warning of what was coming. Instead, it was a French bank that was to American ears as foreign as possible which truly triggered the end. Reuters filed a single report at 2:44am ET on August 9, 2007, detailing the relatively non-specific plans of BNP Paribas to halt NAV calculations for three of its funds. The world hasn’t been the same since. The title of each of those vehicles doesn’t do justice to their gravity, though you can begin to appreciate why these were different in all the ways Ben Bernanke and his band of empty suits never really did. They were: BNP Paribas ABS Euribor, BNP Paribas ABS Eonia, and Parvest ABS Dynamic. Underscoring the dangerous nature of what BNP attempted to accomplish, it has often been recounted incorrectly in the years since. Many articles and blog posts erroneously claim that the bank’s announcement was made on August 7. That date instead applied to the point at which BNP stopped calculating the three funds’ NAV’s, meaning that by the time the public was informed by press release early on August 9 they were already intended to go a third day without figuring the values of the assets within them as required. And what were those assets? Again, the names provide scant clues, entirely for a reason. All you get from them is “ABS” and “Eonia” or “Euribor.” Thus, they are shadow and European? ABS, of course, refers to Asset Backed Securities, a broad classification that captures a whole bunch of stuff, a lot of which doesn’t exist much anymore. The opaque nature of these funds which was intended to make them more saleable now worked against them – don’t worry what’s in them, it’s all complicated stuff required to outperform. In the days immediately following August 9, it was worked out generically that there was “toxic” subprime exposure in these vehicles, and better to panic first than to truly explore what was going on. It was purported that each had 35% of their assets exposed to subprime, when in reality that level was inferred rather than confirmed. A fund could invest up to 35% in this “ABS” stuff, so it was assumed that BNP did (which was as likely true as not). That amounted to some €700 million in assets exposed to losses, a lot for about €2 billion in par value. It was reported widely that these funds had lost 20% in the space of two weeks. In truth, BNP didn’t know what they were worth because the market which valued these securities had completely frozen in the days leading up to all this. The bank wanted, and received permission, to mark its assets to model rather than market prices it was convinced were predicated more on illiquidity than economic loss potential. The funds would do so and actually reopen about a month later. From the outside, then, it is difficult to appreciate the role they played on August 9 in starting up what has been a total systemic break. The real clue comes to us not from “ABS” but references to Eonia and Euribor. Those were the benchmark interest rates used to compare performance. And they were money market rates in Europe, meaning that these were money market funds rather than hedge funds. BNP’s MMF’s do more to express the utterly complicated (and often contradictory) nature of the mature eurodollar system in comprehensive fashion than perhaps anything else. These were European money market funds domiciled in France and Liechtenstein sponsored by a French bank invested primarily in US$ ABS to beat euro money market rates. What matters about geography here? The actual securities held by the funds were not strictly ABS, either. 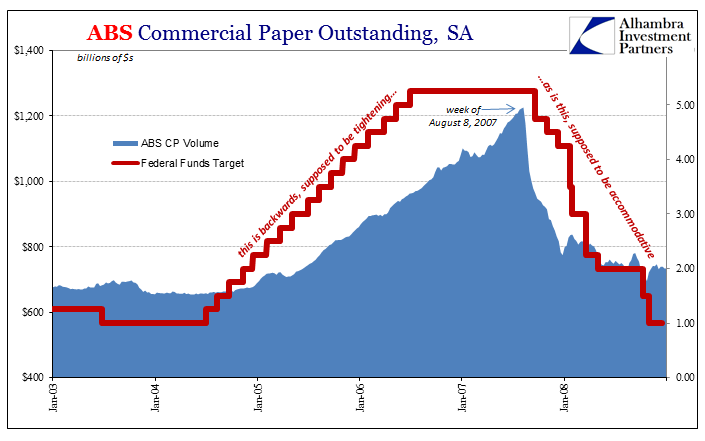 It was, by and large, commercial paper tied to particular parts or tranches of ABS issuers. They were not investing in the US housing bubble per se, merely providing one element of the leverage for others (around the world) to make it so. Wholesale (meaning shadow) banks would often issue CP in order to fund senior and super-senior tranches, the vast majority by volume or par of these securitization structures, as a way to keep them going through and after the dicing and sale process. Being issued by those tranches meant they were the most highly-rated pieces, AA- or often AAA-rated qualifying their commercial paper for “sound” money market investment; which is what everyone believed, or did before August 9. 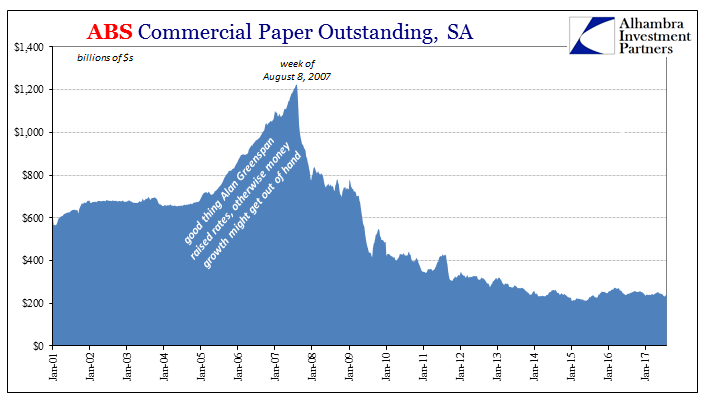 The commercial paper wasn’t really the problem in valuations, either. It was the falling prices of these securitized structures (correlation smiles) that meant money funds could not be assured of repayment of interest or principle at the maturity of whatever CP issue. If a leveraged senior swapout of $1 billion funded by $900 million in commercial paper couldn’t be priced after it was down sharply from par or better, there was the non-trivial chance that its sponsor may have to ditch the thing at less than $900 million, which left CP holders to ponder (and model) prospective losses they could not reasonably quantify. BNP on August 7 stopped trying. If BNP’s money funds were in such a situation, who else? We don’t have to guess as to the effects of this uncertainty, which on August 9 (coupled with a couple other events that occurred that day) took the proportion of outright fear if not its own separate panic. Asset-backed commercial paper issuance had been expanding at a terrific pace all during Alan Greenspan’s RHINO’s – right up until the week of August 8, 2007. At $1.23 trillion that week, this was no trivial monetary source/transfer. The week after, CP volume by ABS issuers had fallen by $50 billion – meaning that ABS sponsors had to find that funding from somewhere else, including nakedly (unsecured) in the eurodollar markets tied to LIBOR. By the end of August, in the space of just three weeks, ABS CP volume had collapsed by $200 billion at a time when billions still meant something. It was a literal funding cliff from which the system could not recover, even if this was the only angle for irregularity. After all, what did the Fed do in its currency elasticity response? The ECB, not the Fed, was first on the scene with additional OMO liquidity, extending an emergency €95 billion in funding loans to European banks on August 9 – euros, not dollars or eurodollars. Only after a few weeks did the US central bank swing into action, and its first emergency measure was to reduce the Primary Credit ceiling, or what used to be called the Discount Rate. By mid-September 2007, almost $300 billion in ABS CP funding had disappeared and the Fed cut the federal funds rate target by 50 bps; the federal funds rate which by its effective condition was already swelled with excess cash during these extreme moments. There was nothing correct about that move, or much of any of those that would follow. The eurodollar market was starved to the point of panic (why LIBOR was and often remained above federal funds targets and pre-crisis spreads), and the agency responsible for the dollar used the wrong tool in the wrong quantity across none of the appropriate dimensions. The FOMC was living in a completely different world than the reality of the situation, always two if not five steps behind; and it would soon show. Money market funds would remain at the center of the action all throughout. The more the Fed did, the less it seemed to matter because monetary policy was a reaction, a tale of what the central bank was responding to not what it could actually do about it. 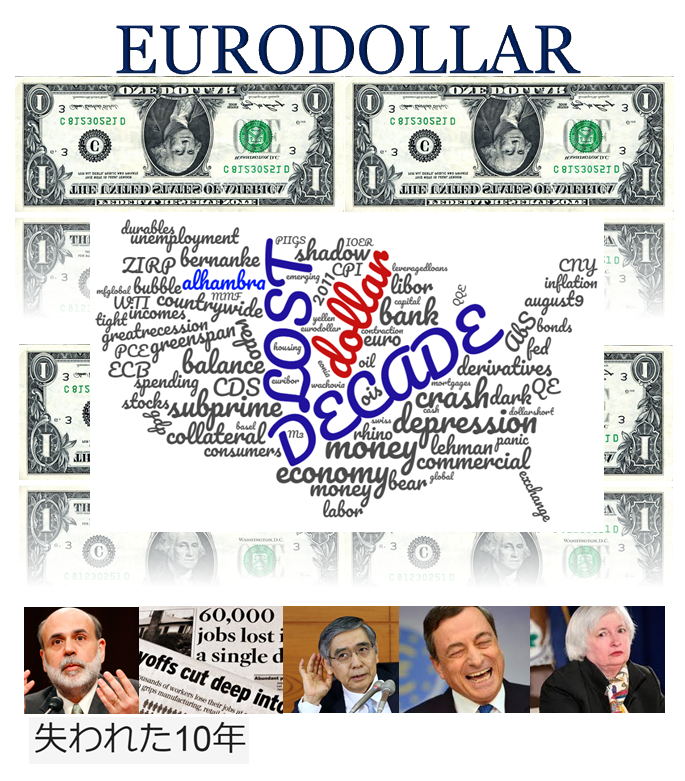 The panic, starting on August 9, 2007, was in every way a monetary panic and the Federal Reserve held no money for it. Through four US QE’s and so many similar ECB measures, that fact has not changed for a decade. The problem then as now was this global credit-based money system that once obeyed no boundaries.